Skil is one of the most popular brands that offer reliable power tools. The brand’s products can be found in workshops and homes around the world. DIYers and professional tradesmen have been depending on Skil saws to deliver results for many years. This portable contractor table saw is designed to handle light to medium duty tasks. It comes with a stand that makes it easier to set up for any job. The tool is ideal for both professionals and DIYers looking for a lightweight unit that is priced close to the entry level. Its cutting depth is sufficient for most jobs and the rip length is somewhat limited by the table. The SKIL 3410-02 has the capacity to handle short use projects that involve intermittent work during the course of the day. The motor is designed to operate at 15 AMP, which enables the unit to execute quality rips. Optimal runs require a good power supply (120 volts) and proper blades. This low cost table saw is well suited for framing, decking and general woodworking tasks. The table saw weighs up to 67 pounds with the table being the heaviest component at 45 pounds. This does not compromise portability because the stand and saw are detachable. Q: Does the SKIL 3410-02 include the saw blade? A: Yes, the unit does come with a blade. Q: What is the maximum rip capacity for this saw? A: The saw’s maximum rip capacity for the left side is 12 inches and 24.5 inches for the right side. Q: Does it include a dust collection port? A: Unfortunately, the SKIL 3410-02 lacks a dust collection port. The saw’s rip capacity of 24.5 inches makes it easier to work on a wide variety of jobs. It allows users to rip sheet materials of varying sizes, including 8 x 4 inches sheets. To cut the sheets, users need to extend the table towards the right side of the unit’s blade. Doing so provides the required width. The product incorporates a 28-tooth blade that is carbide tipped. The blade does a great job when it comes to ripping. However, it performs poorly when used for cross cutting. For this reason, it is best to replace it with a more robust blade capable of handling cross cutting work with ease. This issue is not unique to Skil saws since the majority of manufacturers save money in this department. On the upside, the saw works well with an 8-inch dado blade, which cuts significantly better. The maximum depth of cut that can be achieved using this tool at 90 degrees and 45 degrees is 3-1/2 and 2-1/2 inches, respectively. On the other hand, the miter track fitted on the product is ¾ inches and it comes with a multiple tabs. The gauge on the miter is ideal for a machine in its class while the self-aligning fence has an EZ view management system. The direct drive motor has the capacity to spin at 5,000 rpm and rip through different types of sheet materials. Some of the additional features include anti-kickback pawls and a blade guard with riving knife. The guard is easy to fit and well designed. This Skil saw can work well with 20 AMP outlets; however, extension cables should not exceed 50 feet. The longest cables necessitate the use of a AWG 12-gauge wire. It is important to avoid overloading the circuit while using the tool. Operating the machine from an isolated circuit is recommended. The unit’s performance is rated for the mid-range and it can achieve quality cuts when working on solid and hard woods. Solid and hard woods are cut to within specifications even though the blade determines the quality of cuts on different types of materials. The blade needs upgrading when cutting wood begins to become tough to push through. It is best to opt for 60-tooth blade varieties, which are capable of ensuring high-quality cuts. The maximum rip to the right side, which stands at 24.5 inches is achievable when using the saw without removing the fence. Additional support may be required for the table. The rip fence is built using plastic and aluminum. It fits into the recessed grooves that are located on two sides of the table. The fence uses a basic clamping mechanism and it can satisfy the needs of many users. However, many users have reported that the fence tends to cause jarring movements when changing measurements. Users need to align the fence properly before use. 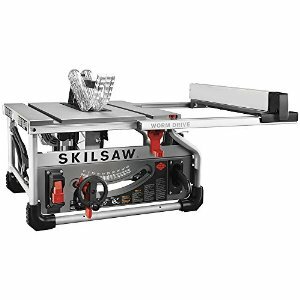 The SKIL 3410-02 10-Inch Table Saw is a reliable tool for DIYers and professionals planning to rip long boards to width or crosscut smaller materials. It enables users to set up the table quickly and easily thanks to the quick-mount system on the heavy-duty stand. The cast aluminum table is designed to extend to 20 x 32 inches when working on longer materials. The EZ view measurement system allows users to achieve accurate settings and the table provides 3-1/2-Inch cut height capacity. This is aimed at cutting through 4X materials. The package includes blade wrenches, a miter gauge, heavy-duty steel stand (foldable) and a 15 Amp motor. Meanwhile, the cord is 6 feet long, thus allowing users to connect to power outlets located far from the ground. The blade, which measures 10 inches is positioned at the center of the table and it can run at speeds of up to 5,000 rpm. Major components on this saw like the motor are sealed to prevent contamination. This reduces the need for maintenance. The motor is also permanently lubricated, thus protecting moving parts. Any dust buildup on external surfaces should be cleaned after use. The product comes with a number of accessories, such as a miter gauge, quick-mount release stand, riving knife, 10-inch blade, blade guard assembly, push stick and safety pawls. Professionals looking for a light-to-moderate duty saw can use this table saw. It is also ideal for home use by do-it-yourself enthusiasts looking to handle small projects. What I didn’t like about this table saw? Although the SKIL 3410-02 10-Inch Table Saw provides a number of benefits, the unit has a few downsides. It does not include a dust collection port and limits the cut size of woods users can achieve. This can have an unfavorable impact on results of the project. On the other hand, the rip fence design has been shown to trigger jarring movements during micro adjustments. The SKIL 3410-02 and 3310 saws shares a number of key similarities, including a heavy-duty steel stand, a 15 Amp motor and the EZ view measurement system for accurate settings. Both units have a table surface of 20 x 26 inches and feature a miter gauge designed to help make crosscuts. The self-aligning rip fence provides a practical way to measure more accurately. The depth cut at 45 and degrees for the 3310 closely matches the depth of the 3410-02. Some of the key factors to consider when comparing the SKIL 3410-02 and Dewalt 745 table saw include inclusion of a stand, portability, type of blades and power. The Dewalt 745 does not come with a stand whereas the 3410-02 has a heavy-duty steel stand. Both are fitted with 10-inch carbide tipped blades. In addition, they are also portable and feature a 15 Amp motor. The Ridgid R4516 and the SKIL 3410-02 both come with a heavy-duty stand, an EZ view measurement system, 3-1/2-Inch cut height capacity, self-aligning rip fence and cast aluminum table. SKIL 3410-02 customer reviews show that the majority of buyers are happy to have chosen the saw. One customer expressed satisfaction that the unit can cut through 4-inch material. Portability is one of the key benefits that have been highlighted. Many say the table saw offers real value for money based on its entry-level price. Another key factor mentioned is easy set up. The ability to separate the stand and table has been noted as providing much-needed flexibility. On average, the tool received a rating of 4 stars out of five. This unit is a good option for anyone looking to brush up their basic cutting skills. It is also useful as a tool for small to medium size projects. Its entry-level price enables many DIYers to take advantage of a table saw with decent cutting and ripping capabilities. However, to maximize cutting performance, buyers should consider upgrading to a high-quality blade.